If you ever thought Marilyn Monroe was not even more gorgeous at age 18, think again. Brunette though. We’re on our way South and the weather is still scorching. Marigold spots a sign saying Buellton, home of split pea soup, so we have to visit. 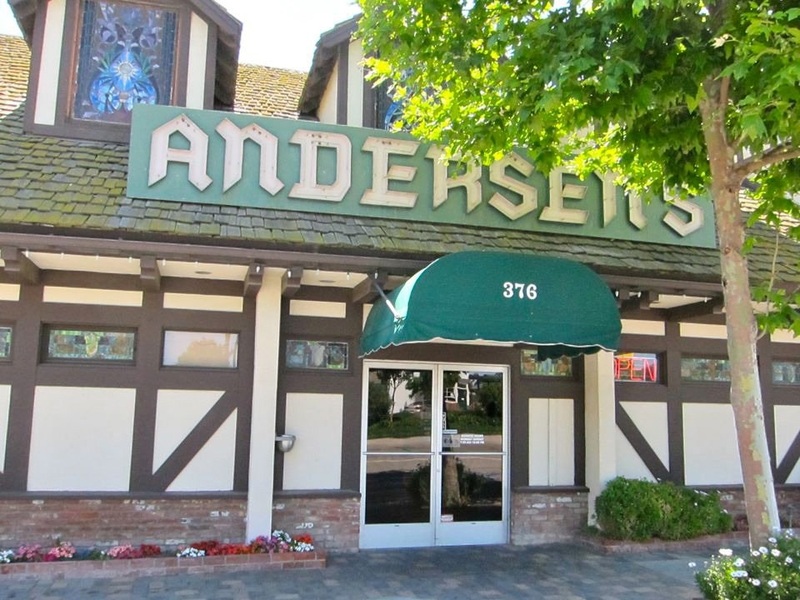 The restaurant called Pea Soup Andersen’s first opened on June 12, 1924. The founders were a Danish family named Anderson. When the 101 freeway was diverted through Buellton and electricity first came to the area, Anton Anderson opened a café and called it “Andersen’s Electrical Cafe,” named after the family’s coveted electric stove– the only one in the Santa Ynez valley at that time. The café is still there, still serving split pea soup from the original recipe and although the café has changed hands now they still serve one and a half million bowls of split pea soup every year. Just outside Ventura we stop again to look at camper vans parked on the beach. 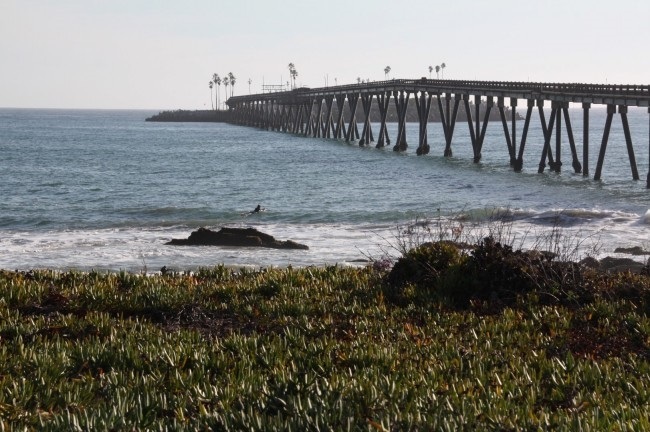 Rincon Parkway has room for 127 RVs, recreational vehicles, and they’re fully booked. They’re really big Winnebago type vans, as big as a bungalow. There’s no mains water, toilets or showers, just a spot on the beach, but they have solar panels on the roof, batteries galore and are fully self sufficient. Well, yes, but it wouldn’t suit us. We’re too fond of wondering what’s around the next bend. More or less around the next bend, turns out to be a surprise and we pull over to watch grass grow. Fields of grass, very green, watered by sprayers and cut very short by about a dozen men using ride on mowers. Imagine the very best bowling green you’ve ever seen, green and perfectly trimmed. Then imagine that bowling green divided into strips and well over half a mile long and at least as long. We stopped for a look and came across a man wearing a red cap, khaki shorts and a running vest looking out over the vast field. ‘Beautiful, isn’t it?’ He said. It turns out he’s the man in charge and has been checking on a faulty valve on the sprinkler system. I pointed at one of the men on the mowers who was wearing a thick sweater, complete with hood and long trousers but no hat. ‘He must be hot,’ I said. It was well over 90 degrees. ‘Who buys all this? Marigold asks. Moving on, we reach a sign for Santa Barbara. Santa Barbara is apparently called the American Riviera. There are similarities, but not too many of ‘em, in our view. The (deserted) beach is a bit scruffy and we soon decide to move on after a brief walk along the shore. Marigold rescues a little dog who’s running along, dragging a lead behind him (probably should say ‘leash’ not ‘lead’) and the dog’s owner comes puffing up, very out of breath, red in the face and also, as I immediately realise, the town nutter. Marigold, being Marigold, of course, starts to chat. I look at the dog; he weighs about two pounds and is not exactly packed with muscle. Marigold gives me a despairing look, but I ignore her belated realisation she has chosen to talk to a weirdo. Marigold and I look at each other. Eh? I stay well out of this conversation. ‘I know the difference between dog mess and man mess,’ the woman insists and off she goes. We feel sorry for Timmy. And the neighbour. ‘I see you’ve met Rachel,’ a woman shouts from alongside a Postal Service van. She’s wearing a US Postal Service shirt and lime green shorts. She laughs and shakes her head. ‘I get to see all sorts, but she’s a lulu. Bet you’re glad you weren’t here day before yesterday. No wonder the beach is empty today and looks a bit scruffy. Eventually, we reach the point at which Highway 1 becomes usable again and is now called the Pacific Coast Highway or PCH. From now on, we drive along with the Pacific Ocean on our immediate right which is lovely. 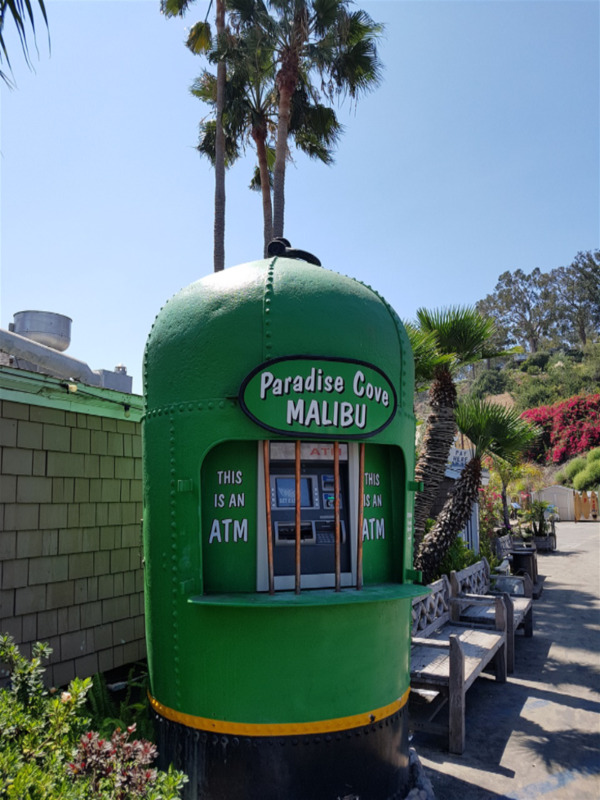 Malibu, 21 miles of scenic beauty, the sign says and absolutely no arguments from us about that. We decide a cool drink is in order so we pull off the PCH when we see a sign saying Paradise Cove Beach Café, Malibu which we both agree is a great address. 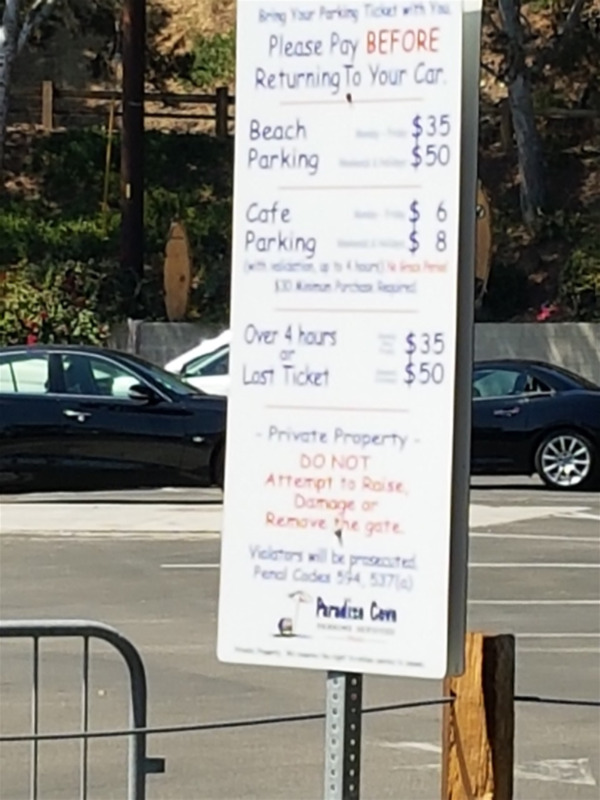 A sign says Beach parking costs 30 dollars, 50 dollars at weekends and café parking is 6 dollars but covers us for up to 4 hours so we take a ticket and go in. Some very expensive cars in the car park. A man wearing red swimming trunks, a red hat and nothing else tells us to ‘go ahead, I’m not in any rush’. 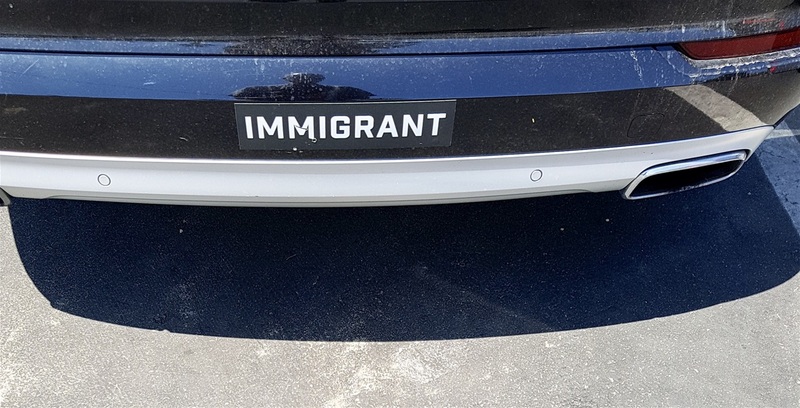 I suspect he means a picture of himself, but fat men in red swimming trunks are not my thing so I just take a photo of the bumper sticker. Inside it’s cool and very busy. The café used to be called Papa Joe’s and has been here a long time judging by the hundreds of photos of celebrities that line the walls. 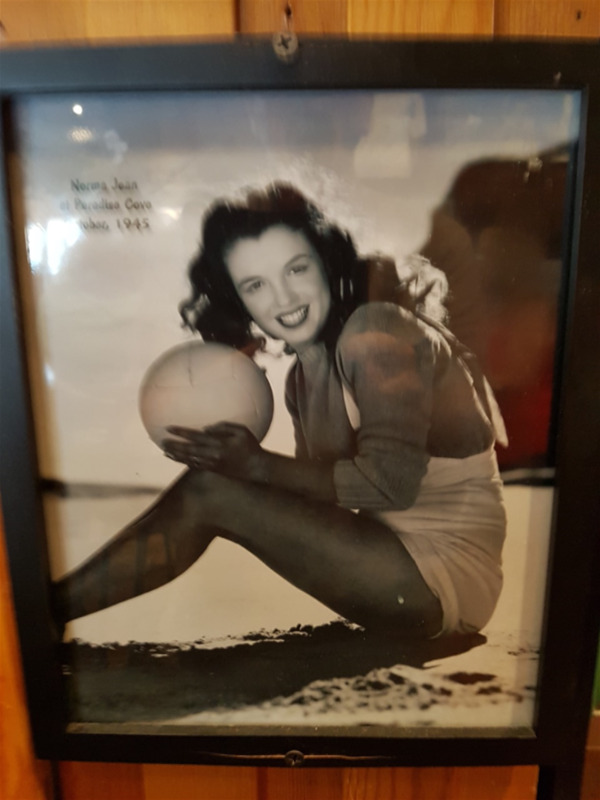 I find Norma Jean Baker, yes Marilyn Monroe again, looking gorgeous in 1945. Our server explains the ‘small print’ of the parking system. Parking costs 30 dollars, more at weekends, but café users pay a reduced rate of ‘only’ 6 dollars if they order a meal costing over 30 dollars. ‘Do many people spend over 200 dollars?’ Marigold asks. We look at the menu to see what we can order that will add up to 30 dollars. It won’t be difficult as everything is very expensive. One burger would be almost enough! 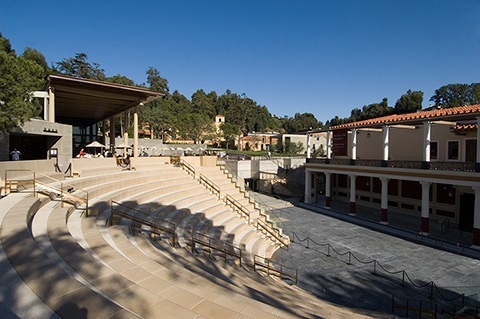 Perched above the PCH – we were looking for it, but even so we nearly missed it - the Getty villa is a museum, mainly ancient Roman and Etruscan artefacts and they’ve also recreated a a Roman villa, both villa and gardens looking great in the sunshine. Free to go in, but you have to pay 15 dollars to park. No need to pay today as the Villa is closed on Tuesdays so we move on. We notice a beach called Dan Blocker beach. There’s a Will Rogers beach almost next door, but Dan Blocker? The man who played Hoss Cartwright in Bonanza? There’s a plaque explaining that fellow Bonanza stars Michael Landon and Lorne Greene bought the eleven acres of beach and named it after their co-star. Dan Blocker set the record for heaviest baby born in Bowie County, Texas at 14 pounds. Big Hoss. Dan Blocker died in real life after the 13th season of Bonanza. Therefore, the producers had to write Hoss out of the show. This was a shocking event as no other young male character had ever been killed off on network television before. Hoss Cartwright’s famous first name is actually a nickname coined from the middle initial of his character. Eric H. Cartwright is actually Eric Haas Cartwright. The beach was an eye sore for many years as there was no access to it from the road and no parking nearby. 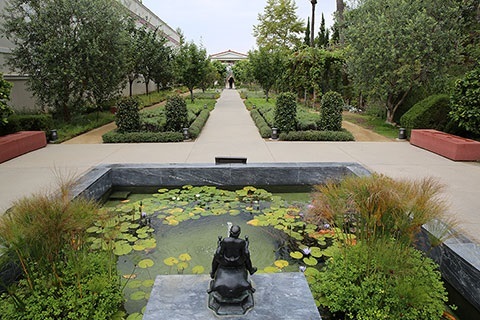 Following a public outcry, a $700,000 grant for improvements was provided by the California Coastal Conservancy in 2004, but the County dawdled, spending only $113,000; the agreement was terminated in 2010 and the money was taken back. Finally, in 2014, parking and beach access was provided and the beach looks great today, Dan Blocker Junior said when the beach was opened. “We are so happy to have it for our kids, to say, ‘This is for your grandpa,’ instead of just a fence.” He also thanked fans from around the world who dedicated funds for a plaque for his father. No more Hoss trivia. We’ve battled through the notoriously awful LA traffic now – Marigold screeching in my right ear as cars switch at random between seven lanes of traffic. I remind her I have driven through the middle of Marrakesh several times and LA is a drive in the country compared to that. ‘Yes, and I screeched all the way through there too,’ she says. Thinking back, yes she did. Ah well, we’re safely in our hotel now and not intending to go out again today. Tomorrow, Los Angeles. Maybe we’ll try and leave the car behind. At least one of us has seen enough of LA traffic. One and a half million bowls of split pea soup a year are served here. Not to us though. Pier leads to Mussel Shoals Beach. Looks and sounds lovely. It’s actually an oil platform. 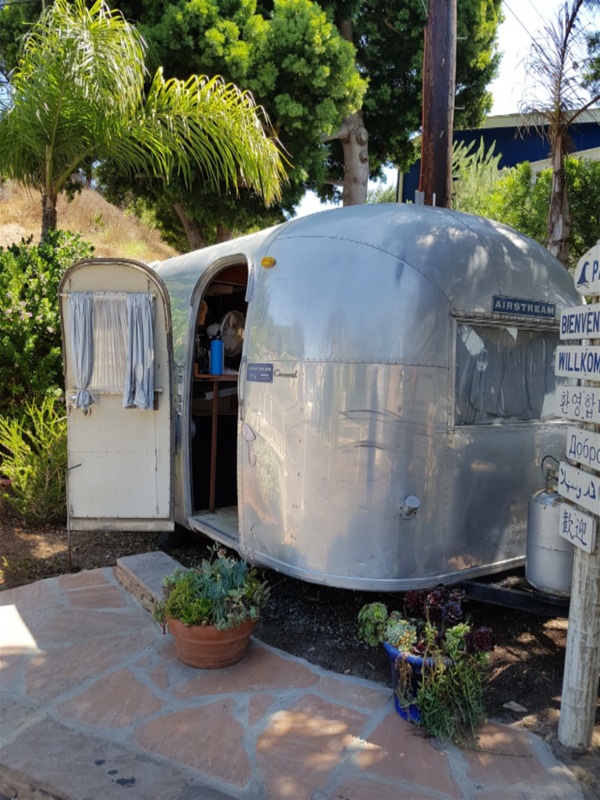 Cheapest accommodation in Malibu. Smallest Airstream we saw, and we saw a lot of ‘em. Confusing prices. We saw ‘cafe $6’ but life is never that simple.